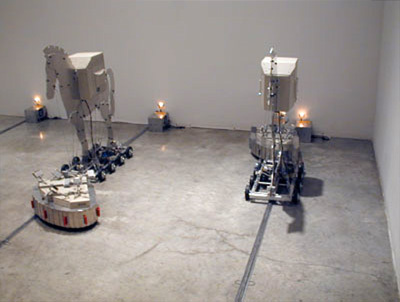 The Infrasense project is a two person collaborative sound and robotic installation. 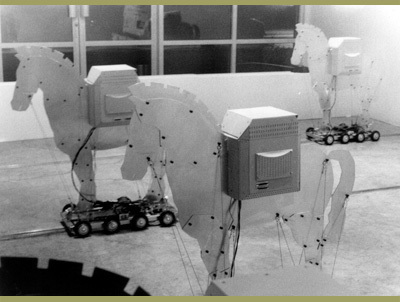 The nine plastic and metal molded robotic sculptures that are representative of the 'Trojan horse' electronic virus will move parallel to each other across the gallery space in a straight line, backwards and forwards. 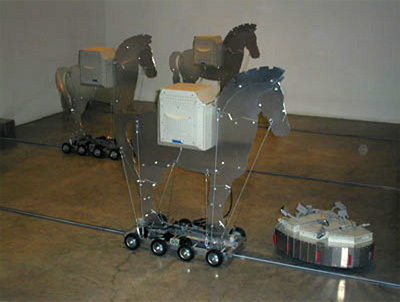 Two faster 'Bugs' that are remote controlled will be maneuvered around the Trojan horses looking as if they are trying desperately for some way to hook up to them or discover what they are carrying. The Infrasense project is the first time that KIT and Robert Saucier have collaborated on a project together. 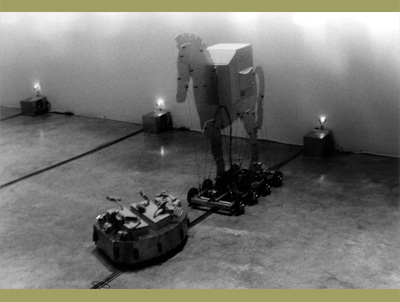 Both artists however, have long histories of producing robotic sound installations and web-based installations and thus have knowledge of software's, hardware and techniques for presenting complex technology based works that have strong social political narratives. The Infrasense project is a work that will travel to a number of galleries in Canada, England, Germany, USA and Northern Ireland. The Orchard Gallery in the City of Derry, Northern Ireland, InterAccess and Subtle Technologies Festival in Toronto, Quartier Ephemere in Montreal, The Folly Gallery in Lancaster, Deluxe in London UK and Vooruit in Ghent, Belgium have all confirmed their acceptance and full support for exhibiting the project. 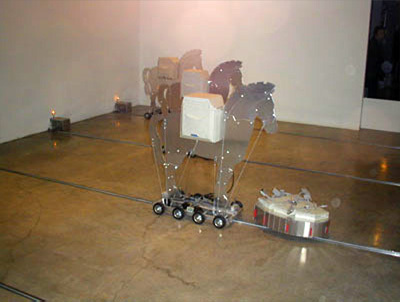 Each time the project travels to a new gallery/location, it will be produced as a site-specific work that changes according to spatial, political and social parameters. This is a very important consideration for the project, as it has to have site-specific relevance to function, as it should do. The links below launch video of INFRASENSE, opening in a pop-up window. A high-speed connection is required. Watch video in QuickTime format. Watch video in Windows Media format.